Logo of the Vousden One-Name Study: searching for ancestral roots. 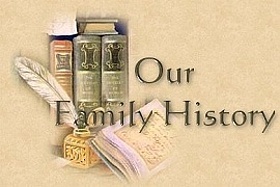 These genealogy web pages are intended to assist anyone with Vousden family connections or interests, anywhere in the world. They contain a wide range of information about my own Vousdens and others that I am researching, in fact about Vousdens in general. My hope is that this web site will help other researchers, become a resource centre for Vousdens worldwide and help re-establish lost links between family members. 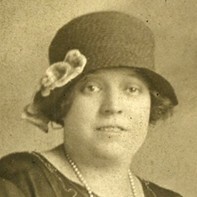 My interest in the Vousdens began with my paternal grandmother, born Agnes Minnie Lucy Vousden in Shoreditch, London in 1893. I have traced my Vousden family back to my 11 x great grandfather, John Vousden, who lived in the 1500s, in Goudhurst. 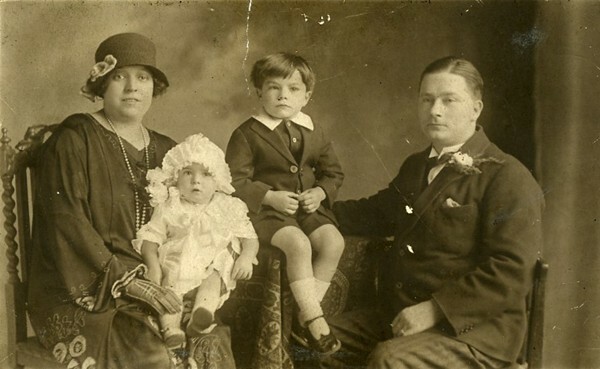 My grandparents, Agnes née Vousden and Robert John Brown in 1925: with my father Daniel and his baby brother Leslie; their sister Betty was born the following year. My fascination with the Vousdens led me to start a one-name study. I have found that the ancestry of most - perhaps all - Vousdens may be traced back to the area around the small village of Goudhurst in the High Weald, a densely wooded, hilly area in the English counties of Kent and Sussex. The Study is world wide since today there are Vousdens not only in the UK but also in Ireland, Canada, USA, Australia, New Zealand, South Africa, Holland, Germany, and probably elsewhere. Also, Vousdens are known to have lived and worked in Jamaica, Egypt and India. I have registered my Vousden One-Name Study (ONS) with the Guild of One-Name Studies. I will answer all enquiries and, hopefully between us we can break down "brick walls" and join all these Vousdens together. The information contained in these pages is just a fraction of what I have accumulated, but hopefully it is enough to stimulate your interest and convince you to make contact. I hope you will contribute your information and share your family stories, just as I will with you, and in so doing, we all will benefit. 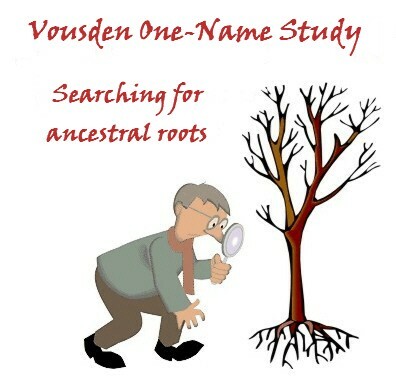 Please contact the Vousden One-Name Study to enquire about your Vousden ancestry; to ask questions; to offer articles, photos or other content; to make suggestions about what you would like to see on this web site; or to report errors or problems with the site, etc. Finally, please tell me what you think about the Vousdens Worldwide project and how you are related to the Vousdens, by adding an entry in the Guestbook, or just look and see what other people are saying. Thank you for reading this. I look forward to hearing from you ... Nigel Brown. 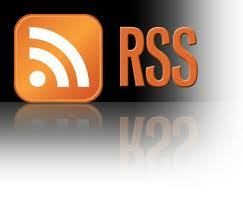 Click into the box below and enter one or more keywords to search the site for. Enclosing more than one word in double quotes (e.g. "Vousdens in Goudhurst") will search for the exact phrase.